It’s Day 2 of our Spotlight on Marlon Brando and I have the pleasure of writing about Julius Caesar. If you can’t tell from my score up there, I love this movie. It’s one of Shakespeare’s greatest and most famous plays (who here didn’t have to recite Mark Antony’s speech in high school?? ), directed by the Oscar winning Joseph L. Mankiewicz (of All About Eve fame), and starring some of the finest actors ever, including James Mason, Deborah Kerr, and, of course, Mr. Brando. With a pedigree like that, one would have to work especially hard to muck it up, but I suppose stranger things have happened. Still, that is certainly not the case here. Oddly enough, I had never before questioned the historical accuracy of the plot… and I was perfectly okay with that. Caesar’s last words just had to be “Et tu, Brute?” didn’t they?? Well, as it turns out, maybe they did. Shakespeare’s account of the betrayal and murder of Caesar by his peers and protégés is (mostly) based on Plutarch’s Lives of Noble Greeks and Romans, and while we will never know for sure, it does make it all the more impressive and all the more tragic that these events likely went down in a similar way in real life. 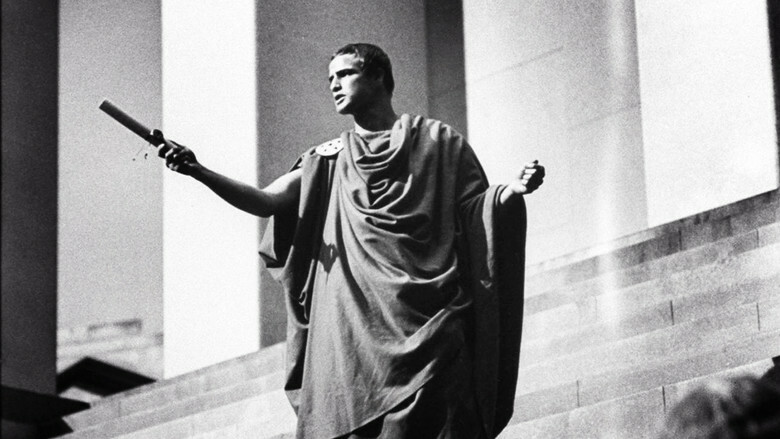 Brando plays Mark Antony, and though he receives top billing, his character is largely absent for the first half of the movie. But when he finally does appear, man, is it one of the most dynamic and exiting moments in all of cinema. It’s the turning point; you see, Antony was not part of the group that betrayed Caesar, and yet, for whatever reason, he is not murdered despite knowing the truth. In fact, Brutus even allows him to speak at Caesar’s funeral, a mistake that changed the course of history, because Antony is able to get all of Rome on his side in a show of solidarity for Caesar. They are united against the “noble” Brutus and war is started. Brando is simply electric here, delievering his speech with such gusto that you’re likely to be standing up and yelling at your television by the end, cheering with the good people of Rome. But this is actually why I’m giving the film 3.5 stars instead of 4. Antony’s speech is easily the best part, and it never again reaches such heights. That’s not to say the rest isn’t extremely well done, but it just pales in comparison. Still, I definitely recommend this movie, especially if you’re only vaguely familiar with the play. The words really come off the screen and it remains one of Hollywood’s best Shakespeare adaptations. Tomorrow, I’ll be returning for Day 3 with my review of The Wild One, so come back and check it out! !